A Friendship For The Ages. One of the world’s greatest and longest running musical partnerships ended gently at 3 am Monday August 29 in Chicago when blues guitar legend David “Honeyboy” Edwards died in his sleep. As the last of the first generation Mississippi Delta bluesmen, his death closes a chapter in the history of music. And it meant parting company with his harmonica player/manager/biographer/record label owner and closest friend Michael Robert Frank for the last time in their 39-year professional collaboration. Michael and Honeyboy had played together for more than 38 years in hundreds of bars, auditoriums, arenas and festivals all over the world. At 96, Honeyboy was the last Mississippi bluesman alive who had played with Robert Johnson, the man regarded as the king of the blues guitar. When Honeyboy was 22, he was in Greenwood, Mississippi, with Johnson the night he was poisoned and died, presumably by a jealous husband, according to Honeyboy’s autobiography “The World Don’t Owe Me Nothing,” which he told to my brother Michael Robert Frank and co-author Janis Martinson. At 17, Honeyboy, the son of a sharecropper, began venturing far from home in Shaw Mississippi as an itinerant bluesman, playing his guitar for nickels and dimes on the streets of Mississippi, Tennessee Alabama, Arkansas and Louisiana. Between 1932 and 1956 he played in 13 states, gambling, working odd jobs, and playing the blues. He settled down in Chicago in 1956. In 1972, my brother Michael Frank was just out of college and working as a social worker rescuing abused children when he met Honeyboy at Biddy Mulligan’s, a Northside Chicago bar that featured the blues. Michael, a budding harmonica player, had moved to Chicago from our hometown of Pittsburgh, Pa., to hear and meet blues musicians in local clubs. He considered the elder bluesmen as revolutionaries, during the depression and pre-civil rights era. Honeyboy, Big Walter Horton, Sunnyland Slim and some of the other old blues legends in Chicago began teaching Michael how to play, sharing their stories, and tutoring him in the traditions and nuances of the blues. Those lessons remained much in evidence when Michael accompanied Honeyboy as he always complimented and filled in the sound of the lead guitar player and singer and never played over him. In his autobiography, Honeyboy details his wariness of white dominance over the black sharecroppers he came from and the white enforcement of crushing segregation. If he trusted anybody, it was Michael and no matter who had an offer or a request, Honeyboy would say, “Ask my manager.” He was never star-struck, a lesson he also imparted to Michael. 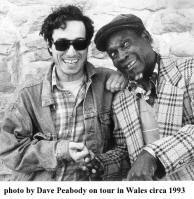 When Keith Richard appeared unannounced at a small and now defunct blues club called The Boxcar in Southport, Ct. May 21, 2004 to hear Honeyboy, he joined Michael and second guitarist Rocky Lawrence on stage because he wanted to play a number with Honeyboy. At a House of Blues special tribute to Honeyboy in Boston October 8, 2010 organized by The Reel Blues Fest, Bradford Whiford of Aerosmith, James Montgomery and three dozen other bluesmen and women clamored to join Honeyboy on stage and later- in the Blues Foundation Room. Honeyboy –right down to his memorable venerable face- oozed the blues just talking to you. Although Honeyboy was not known for his songwriting and did not compose many songs, his treatment of the blues classics was unmatched, whether it was “Goin' Down Slow,” “Pony Blues” or Robert Johnson’s “Sweet Home Chicago.” His fingers were lightning fast and strong. Especially when he played slide guitar, Honeyboy’s sound was instantly distinctive – penetrating and clear – note-by-note. He was one of the few slide masters who played in standard tuning. As a special treat, I booked Michael and Honeyboy to play at my 60th birthday party on the lawn at our house in Lyme, Ct. To accommodate me, they performed in Massachusetts, Rhode Island, suburban New York and New Jersey. Arriving exhausted after a Saturday night gig in Boston, at age 92, Honeyboy insisted in napping in the car before he played that Sunday afternoon. Copyright © 2019 Allan Dodds Frank. All Rights Reserved.